I'm usually a bit wary of books in verse. Poetry isn't my preferred genre, and novels in verse tend to fly by a bit too quickly when I read them. But Jacqueline Woodson's "Brown Girl Dreaming" received too many rave reviews to ignore. After she handled the racist joke that marred her acceptance of the National Book Award with perfect grace and dignity, I bumped this book up to my must-read list & got the audio from Overdrive. As I mentioned in my brief Goodreads review, this book is entirely deserving of all of the accolades it has and will receive. Woodson's prose is simple and elegant. She tells her life story from her infancy in Ohio, to her time with the grandparents in South Carolina, to her move to New York with her mother. She writes of her four siblings, her cousins and other relatives, growing up during the Civil Rights movement, and finding her passion for writing at a young age. Despite the verse, there's still a definite story of a young girl growing up in a rapidly changing world. The simplicity of the poems belies the universality of her experience. One poignant poem describes how she went by Jackie in school to avoid having to write a 'q' in cursive on the board. Who hasn't gone to desperate lengths to avoid embarrassment in front of peers? For young writers, her story inspires. Her older sister was the smart one, Jacqueline had to work hard to succeed in school, but she just kept writing. Clearly, it has paid off. Verdict: Affirmed. If you're looking to diversify your reads, this is a great place to start. Though marketed as middle grade, adults will enjoy this quick, deep read. Additionally, Woodson does the excellent audio narration herself, ensuring you'll hear the poems read as she intended. 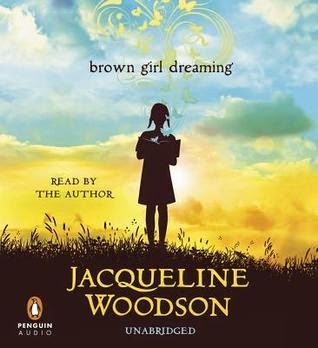 "Brown Girl Dreaming" written and read by Jacqueline Woodson, published on August 28, 2014 by Penguin Audio.